FIGURE 5.10. Single k value for decay [regressions of % mass remaining over (a) nitrogen, (b) sulfur, and (c) phosphorus concentrations in the residual litter for flowering dogwood, red maple, and chestnut oak]. (Reprinted from Blair, J. M. [1988a], with permission). coefficient of determination (r2) for these curves usually exceeds 85%. The constant k conceals seasonal dynamics but is a useful means for comparing leaf types or habitats, or geographical regions. More precision can be gained by calculating k from the spring-summer values alone. Some typical breakdown rates for forest litter are shown in Table 5.3. FIGURE 5.11. Mass loss rates for surface (a) and buried (b) rye litter over 320 days. 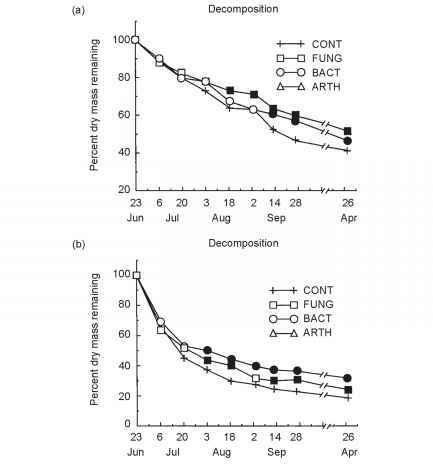 CONT, control situation; FUNG, fungicide, with about one-half fungal population biomass; BACT, bactericide (oxycarboxin); ARTH, arthropod repellant (naphthalene). Filled symbols are significantly different from controls (p < 0.05) on a given date. (Modified from Beare et al, 1992, with permission). following plowing (conventional tillage) (Beare et al, 1992). Loss rates were faster under conventional tillage (k = 0.03 per day) than in no-tillage soils (k = 0.02 per day). Usually, buried residues decompose more rapidly than surface residues because of more intimate contact with mineral soil and microbes and because of more moderated microclimate beneath the soil surface. In any case, rates for rye litter were much faster than for forest tree leaf litter. 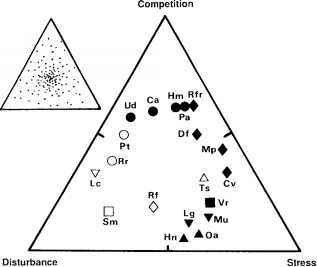 To establish the extent of impact of faunal-moderated decomposition on plant residues, Tian et al. (1995) used gnotobiotic microcosms with residues of five plants from tropical agroecosystems (Dactyladenia bar-teri, Gliricidia sepium and Leucaena leucocephala prunings, maize stover, and rice straw) placed on the surface of large pots filled with an Oxic Paleustalf in Nigeria. The soil was defaunated by sun drying and the larger fauna removed by hand. Eighteen mature earthworms (Eudrilus eugeniae) and/or three millipedes (Spirostreptidae) were then added to a subset of pots. The experiment was run for 10 weeks, with an intermediate sampling of mass losses occurring after 4 weeks. Both earthworms and millipedes contributed more to the breakdown of the low-quality litter (Dactyladenia, maize stover, and rice straw) compared to the decomposition of the higher-quality leguminous tree prunings (Tian et al., 1995). This effect has been observed in a number of forest ecosystems, as noted later in this chapter.